A couple weeks ago, I posted about Lisboa, Portugal, and how I would visually represent Lisbon if instead of a city, it were a brand. You can read all about the power of thinking of your brand as a person in that post, but today, I’m going to perform the same exercise with the vibrant city of Rome. If Rome were a person, she’d wear all warm tones: dusty pinks, desaturated oranges, and sunshine yellows. She listens to History Channel podcasts while she drinks limoncello on her porch overlooking the city. Her apartment dates back to pre-war periods, with textured walls and vintage furniture pieces from her travels. She people watches and has a bright, sunny personality. Rome buzzes with casual energy, at ease in all situations. She is palatably likable by all people she meets, partly because she’s pleasant and partly because she makes people nostalgic for a simpler time and meeting her feels like traveling back to yesteryear. Rome is a laid-back, vibrant, energetic city-dweller. She tells borderline dirty jokes at the dinner table and talks policy like a politician all while switching easily between languages. 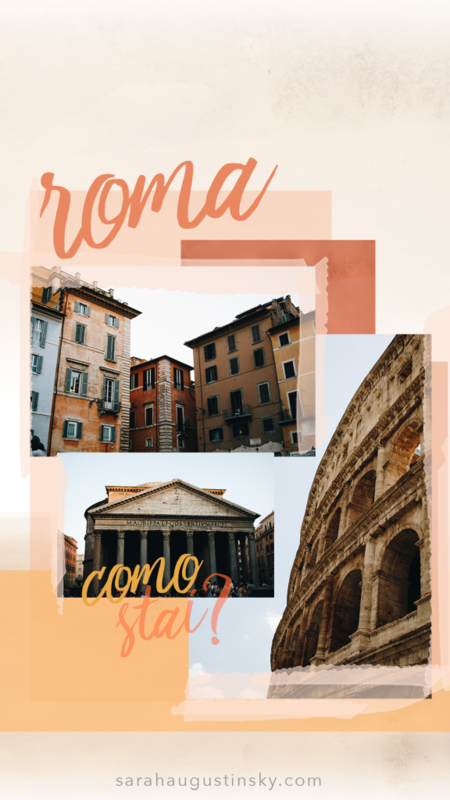 Translating Rome into a visual branding strategy came naturally to me. From the Italian Renaissance prints in her living room, I pulled washes of pink paint and placed them across the edges of photos of some of the most recognizable Roman points – the things that make people nostalgic. The photos again have a film-like quality to them, with simple composition focused on one main structure and that structure’s details. I associate the old sites with the books that I first saw photos of those landmarks in, so I chose an aged paper texture for the background of this collage as a nod to the wonder that we’ve all had for these edifices since childhood. The colors were easy to pick; the oranges, pinks, and browns scream Rome to me. They reflect the warmth in the brand’s personality and the digital marketing strategy should generally have a warm, sunny personality to them as well. Again, I encourage you to personify your brand and give it human qualities. You never know what you can learn and discover about something you knew well by approaching it from a different angle.